-->> ..there's a just a tiny bit of SQUASH and Stretch quality ( ..the old "Bugs Bunny" animation terminology referring to the rubber band quality of those of cartoons ) to these. As great and superhero like the refined turtles are, I really love the old first appearance look too. If you ever want to sell that Leo one, let me know. I'll manage to scrape up as much money as I can. I love that piece! I agree with Ecto. I just love the early work. When I go back and look at the original comics, it's hard to believe how quickly the look of the turtles changed. Absoultely LOVE this early art!! Its great seeing the transition over time of how they evolved. Good call Daniel, these definitely do look like a link between the first early sketches and the first issue. It's really cool to see how they progressed. Hey Pete I was just wondering if maybe you could mix in a little more current news on TMNT related things, because many fans have many questions that are not being answered. I know that I am not alone and certainly not in the minority of fans who are concerned with how things are going with the 25th anniversary stuff. Especially stuff invovled with NECA, a new movie, a new cartoon, the fate of both comics and so on and so forth. Perhaps you could start shedding some light on these topics amongst others and concentrate a little less on the "Blast From the Past" posts. Better yet, take a bunch of these posts (the art) and the blurbs you write about each of them and compile them and put it in a nice book. I know I would pay top dollar for it and I'm sure I am not alone. Joe, that's what Murphy was doing and we fans blew it. Really this is Pete's blog and he should feel free to do what he wants. 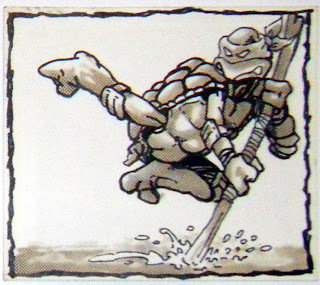 Though I too wouldn't mind more current TMNT news, nothing is better than seeing original artwork that we've never seen before. Ectopaul- That wasn't really entirely the fans fault. His last couple posts on the blog seemed to suggest a refocusing of his personal time otherwise anyway. Ecto I responded to your comments on the Drome but I will say the same thing here. I understand that this is Pete's blog and that he is free to do what ever he wants with it. I am free to post my opinions freely. My intention was not to hijack his blog. I only said what I said as a suggestion. I feel that my sugggestions have merit and the questions I posed are important and should be answered. I just have a deep concern for the current state of the TMNT. Again I meant no disrespect by my opinion because I do still appreciate this blog as I check it every day but that still does not erase my concern. -->> o you guys are two sides of the same coin. you are both ok !! I went back looking hoping that you'd gotten some sort of answer to what's happened with Neca and tmnt it's been some time since we've seen or heard anything about the second wave with Shredder and the Foot. I've heard word that they are mad because of the Playmates thing which seems a bit silly and I hope not true. But I was looking forward to asking them myself at the NYC Comicon but alas they won't be going. I look forward to meeting you in person after all these years of being not only a fan of the turtles but your art as well. Thanks for any light you can shine on this Neca situation though. Pete, Vaughn pretty much summed up what I would like to know regarding NECA. Whats up with the second wave of figures? Are they still in the works? Also, I would like to know about the current state of both comics. Such as, is volume 4 going to be wrapped up anytime soon? Whats a general timetable for it? Also we heard about the sales threshold that Diamond distributors has instituted on comics, is there any word on how this will specifically affect Tales in the immediate or distant future? Also, is there anything to be said regarding another TMNT film. I havent heard anything in a long time. Hi Peter, I have a few questions to ask if you don't mind. I would like to know who at Mirage is responsible for getting the word out about the ninja turtle products, specifically the comics? Is there anyone at Mirage who is in constant contact with comic book community (websites, magazines, retailers, ect.) in order to keep the TMNT name visible. Other then particpating in FCBD, does Mirage have any other special promotions lined up to promote the comics? Also will we be seeing full season box sets of the 2k3 cartoon with extra bonus content? Such a product is long overdue. And, has Mirage ever attempted to buy the rights to the old toon from Fred Wolf Films? I would like to know who at Mirage is responsible for getting the word out about the ninja turtle products, specifically the comics? Is there anyone at Mirage who is in constant contact with comic book community (websites, magazines, retailers, ect.) in order to keep the TMNT name visible. Other then particpating in FCBD, does Mirage have any other special promotions lined up to promote the comics?" Probably the person who best fits that description here at Mirage is Dan Berger, though I think "constant contact" might be a bit extreme. I am not aware of any other special promotions. "Also will we be seeing full season box sets of the 2k3 cartoon with extra bonus content? Such a product is long overdue." That would certainly be nice, and I would be happy to do more of those interview/commentary things included on some of the earlier DVD releases. However, as far as I know, nothing like that has been planned. "And, has Mirage ever attempted to buy the rights to the old toon from Fred Wolf Films?" Pete, Vaughn pretty much summed up what I would like to know regarding NECA. Whats up with the second wave of figures? Are they still in the works?" ... plus various re-paints and re-decos based on the colorized comics. They hope to show the line at Toy Fair and try to get enough EU (European Union) interest that they can manufacture these figures." "Also, I would like to know about the current state of both comics. Such as, is volume 4 going to be wrapped up anytime soon? Whats a general timetable for it? Also we heard about the sales threshold that Diamond distributors has instituted on comics, is there any word on how this will specifically affect Tales in the immediate or distant future?" The fate of Volume 4 is uncertain at this point. As I have said in the past, I would like to wrap it up in another six to ten issues (preferably six). Issues 30 and 31 have been drawn, with the tones on 30 almost finished and the inking on 31 nearly done. To be frank, my energy level for working on the TMNT book has been not that high over the last couple of years, for a variety of reasons. I have pretty clear ideas for how I want to conclude this series, and hope to do it over the next year or two. That's about as specific a timetable as I can give you at this point. I am not sure how or if the new sales threshold rules from Diamond will affect Tales. That would probably be a question better asked of Dan Berger. "Also, is there anything to be said regarding another TMNT film. I havent heard anything in a long time. Thank you for the quick response Pete. I appreciate it very much. "Probably the person who best fits that description here at Mirage is Dan Berger, though I think "constant contact" might be a bit extreme. I am not aware of any other special promotions." Between running the ninja turtles website and looking after the comic line, that doesn't seem to leave alot of time for Dan Berger to devote to promoting the comics, without constant contact with the comic community, the TMNT comics are bound to be overlooked and forgotten. "That would certainly be nice, and I would be happy to do more of those interview/commentary things included on some of the earlier DVD releases. However, as far as I know, nothing like that has been planned." Has Mirage approached 4Kids/Funimation about doing such a project, I can't see why they wouldn't do it. "I have a vague memory that we looked into that possibility at one point, but I think a combinaton of the price being too high and my interest level being too low prevented that from going forward." What about now, personally, I wouldn't be comfortable if someone else was holding any part of an IP of mine hostage. Has their asking price gone up? 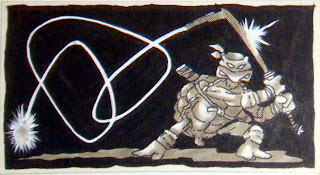 "To be frank, my energy level for working on the TMNT book has been not that high over the last couple of years, for a variety of reasons." Would hiring someone to ink and tone(or possibly color)the comics make things easier for you? And have you considered switching TMNT to a limited series format, as many other independent comic creators do? Also, if we have indeed seen the last of the current tv series, and Mirage is no longer on the hook for a third of the production cost of the series, is it possible for Mirage to start looking into the direct to dvd market? Thank you for your respones Peter, they are very much appreciated. Thanks for the info about the NECA figures, I sure hope they get them out, it's taken way to long already. -->> .. this issue is already being handled by not just the fans but an insider who works for Mirage himself. Allot of these ' COMIC GUYS ' in the community are Turtle fans. While it's slow.. this is being tackled and things ARE changing to positive effects. There is real hope for the TMNT comics scene . Like i always try to say ( and continually remind myself ) :: patience and perspective is the # 1 key.